(Nanowerk News) IBM scientists have demonstrated a promising and practical method that effectively eliminates the mechanical wear in the nanometer-sharp tips used in scanning probe-based techniques. This discovery can potentially be used in the development of next generation, more advanced computer chips that have higher performance and smaller feature sizes. Scanning probe-based tools could be one approach to extend the capabilities, quality and precision beyond the projected limits of current production and characterization tools. Scanning probe-based techniques utilize tiny, nanometer-sharp tips borrowed from atomic force microscopy to manipulate nanostructures and devices by scanning or rather sliding in very close proximity over the surface—similar to the way the needle of a record player on a record. Today, these techniques—including for example the well-known atomic force microscope—are established tools for scientists to explore the nanocosmos. Scanning-probe techniques today allow for the highest possible resolution down to the atomic or molecular scale and represent essentially the scientists’ “eyes”, “ears”, “nose”, and “hands” as they explore the smallest objects known to mankind. In the semiconductor industry, these techniques due to their atomic resolution and manipulation capabilities become increasingly attractive for use in the development and manufacturing of next generation chips with ultra-small feature sizes. While small by most standards, today's 40 nm transistors can still shrink further, but it becomes increasingly challenging and costly since the current tools and methods to develop and process the chips out of silicon wafers approach physical limitations for critical chip layers. “Continued scaling to further increase device performance will require new device architectures, smaller feature sizes and new materials. Tools based on scanning probe technology could become essential for the metrology of future technology nodes as well as for the development, fabrication and characterization of novel nanoscale devices,” says IBM Fellow Evangelos Eleftheriou of IBM Research – Zurich. 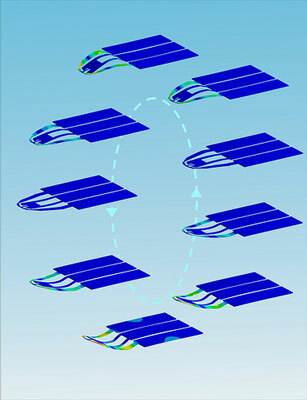 In their paper, published in the September issue of Nature Nanotechnology ("Dynamic superlubricity and the elimination of wear on the nanoscale"), IBM scientists solve this challenge by “demonstrating the effective elimination of wear on a tip sliding on a polymer surface over a distance of 750 meters by modulating the force acting on the tip-sample contact. By applying an AC voltage between the cantilever—the mechanical arms on which the tips are attached and over which they are controlled—and the sample surface, the cantilever can be excited at high frequencies of one Megahertz. The cantilever bends and the tip vibrates with an almost imperceptible estimated amplitude of one nanometer. “Though vanishingly small, it is this vibration that greatly reduces friction and “effectively” eliminates—to below the detection limit corresponding to the remarkable low number of losing one atom per meter—tip wear under experimental conditions,” states Bernd Gotsmann of IBM Research – Zurich. After the 750-meter wear test, which took a week of continuous operation, the tip was still operating flawlessly. With the wear problem tackled, researchers at IBM Research – Zurich are now investigating a number of possible applications of scanning probe-based technologies including nanofabrication, nanolithography and high-speed metrology. Operating a large number of tips in parallel would enable, high-throughput, high-speed, automated metrology systems for potential use in chip development and manufacturing. Such metrology systems could characterize device dimensions or identify defects on the structured silicon wafers with much higher precision and accuracy and potentially lower cost than currently available tools. Scientists at IBM Research – Zurich are also investigating powerful scanning probe-based method for high speed patterning of complex two and three-dimensional nanoscale structures.